This page is a revised version of the original submission of an article entitled "Better Bachmann Sound For Under A Buck" published in the Feb. 1998 issue of Garden Railways Magazine. Editorial changes and additional artwork that might have been added by Garden Railways are not included in this document. The Bachmann Big Hauler locomotive has improved greatly over the last few years in appearance, reliability and noise level. However one thing that hasn't improved is the very basic sound system. The system provides a pretty poor facsimile of an exhaust sound in the form of a "chuff" that is synchronized to the engine drivers. The system can't provide anything near the pleasing sound of new digital sound systems, but for less than a dollar's worth of parts and a few minutes labor, the sound can be materially improved. The "profile" of the exhaust sound is much too sharp in an unmodified sound system. Addition of one resistor and one capacitor to the sound board in the tender will soften the attack and delay of the exhaust beat. The frequency response of the system leads to a tinny sound, two more parts can improve the low frequency response. The sound system generates only two beats per driver revolution while real steam locomotives have four exhaust beats per revolution. 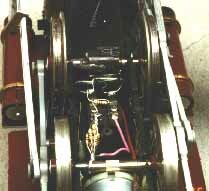 Addition of two short wires or resistors to the sound drum on the front axle in the locomotive adds the other two beats. The system has the annoying tendency to sometimes hiss continuously when it stops with the sound contacts closed. A simple track power sensor can shut it off when the track power goes away. Each of these changes can be made independently and all are completely reversible. I find that the addition of these simple modifications makes a material improvement to the Bachmann Big Hauler, ones that Bachmann should incorporate in some future model. Often real steam locomotives will generate beats of different amplitude on the forward and backward piston strokes. This is sometimes caused by the engineer adjusting the valve timing to modify locomotive performance, especially at low speeds, but more often it is caused by a tired and worn valves or a number of other problems. This can result in a "CHUFF CHUFF chuff chuff" sound sequence. While this variable exhaust sound usually doesn't happen all the time, it is more interesting than steady and unchanging exhaust sounds. This sound sequence, or any other repeating four pulse beat can also be accommodated by simple and reversible modifications to the sound drum. The sound generator circuit board sits in the tender of the locomotive. A schematic diagram of the circuit is shown below. 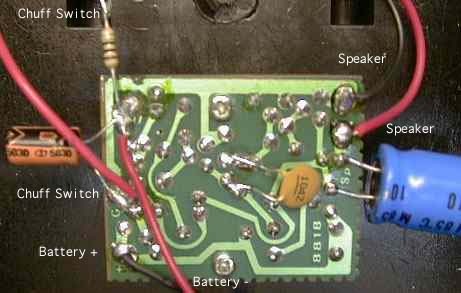 The circuit consists of a noise diode and a high gain amplifier to drive the speaker. The sound system is switched on and off by the sound drum in the locomotive which either connects or disconnects a tender mounted 9 volt battery. On RC Big Haulers, switched 9 volt power comes from the locomotive battery. The modifications described here will work for either version. 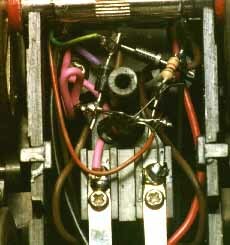 In the RC Big Hauler, the sound circuit is part of the motor controller board in the engine smokebox. The circuit is the same and it occupies the rearmost third of the circuit board. Gain access the sound board by removing the four screws on the bottom of the tender that hold on the tender body and then remove the body. Remove the two screws that attach the coal load and drop the screws into your junk box. The coal load will stay in place by itself when you reinstall it later. Reinstall the tender body and work through the hole exposed by the removed coal load. Its actually easier to do this mod with the tender body installed because the tender body is the battery holder too. Locate the black wire that leads to the locomotive as shown in the photo. It should go a pad on the board that also has a white wire leading to the battery. Unsolder the black wire. Install one end of a 10 to 22 ohm resistor and the positive lead of a 33 to 50 microfarad capacitor to this pad. Solder the black wire back to the other end of the resistor. Solder the negative lead of the capacitor to pad which is connected to the red wire that goes to the locomotive (this pad is marked with a "G"). Put the battery back in and then use a short piece of bare wire to short the terminals of the connector leading to the locomotive. The system should generate noise as long as the short is applied. This is all the work that is needed in the tender. 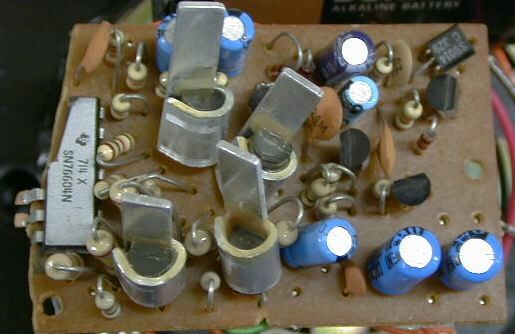 Note that in the Garden Railways article and an earlier version of this page, the additional capacitor was shown connected incorrectly. If your sound system hisses softly when it should not be making any noise at all, the either the capacitor is in backwards or it is defective. What you have done is added a time delay to the chuff switch. The capacitor stores a small amount of electrical power and causes the chuff to die off a little more slowly that it did before. The 10 ohm resistor and the capacitor also delay the onset of the chuff to make it start a little less sharply. The resistor also has another important function. It limits the discharge current pulse from the capacitor when the sound drum contacts close. If the resistor were not there, the contacts in the locomotive would arc just a little and slowly erode. You can modify the sound drum on the front driver axle to provide four equal beats per revolution as in the prototype. This is done by adding two more contact bars to the sound drum. The downside of this modification is that you are twice as likely to stop the engine with the contacts closed and the sound system running constantly. Also, if you like to run your engines much past their prototypical 25 scale MPH, you may find that they just chuff too much. This same modification can be made to the Bachmann 2-4-2, but since it has smaller drivers, it chuffs more at any given speed and you may find that it chuffs too fast. To make this modification you have to make minor changes within the locomotive. Prop the Big Hauler upside down on your workbench. I use two 2 x 4 wood scraps to support the cab roof and then the smoke stack acts as the 3rd point of a stable three point support as shown. Pull the pilot support wires from sides of the smokebox. You might have to pry them out. Remove 4 screws on the bottom cover of the engine and gently pull off the bottom cover. The bottom cover will still be attached by two wires leading to the front truck, be careful that you don't break these wires. You can put the longer screw back in to hold the cylinder saddle in place. Prop the bottom cover to the side. The sound drum is a black plastic cylinder on the front driver axle. 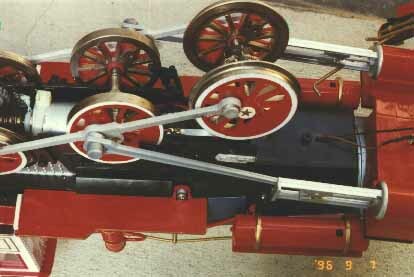 It has two metal straps attached to it that contact two metal fingers attached to the locomotive frame. I find that hot glue sticks well enough to the drum to attach two new contact wires, but unless you want to shim the axle (see below) you should attach the wires with Zap-CA as hot glue leaves too big of a lump. Clean the drum with a pencil eraser and some rubbing alcohol and then glue two bare wires across the drum between the existing straps so that there are contacts at four points around the drum. You can connect the tender and run the locomotive by using clip leads to connect the pilot wheels to a power pack to test the modifications. You should also use this opportunity to lubricate the gearing with a heavy duty Teflon gear grease available at your local hobby shop. If all is well, carefully reinstall the bottom cover. Be careful not to pinch the wires to the leading truck and make sure that the hook at the back of the locomotive moves freely. You may have to wiggle the cover and cylinder saddle around some to get the cover to seat correctly. If you would like the sound of a poorly running or mis-timed engine, then you can arrange that as well. Instead of installing a straight wire across the sound drum, you will install a 100 ohm resistor at the position where you want a lower volume chuff. However, before you install the resistor(s), a little modification to the front axle bearing is required. The front axle has about 0.2" of total lateral play. This causes no difficulty with the standard sound drum, but it makes installation of the 100 ohm resistors difficult. The easiest way to mount the resistor is right in the center of the drum so that it will pass between the two contact springs. However, the lateral axle play will make the resistors interfere with one of the two springs as there isn't enough room between the springs to accommodate the play. I solved this problem by shimming the wheels to eliminate the lateral play. The photo shows where I glued styrene strips to the outside of the frame to minimize the lateral play. Both of my engines took about 0.100" of styrene thickness on both sides to reduce the play to less than 0.01". Elimination of the axle play does not seem to have any detrimental effect on locomotive tracking and it does have some advantages. Some Big Haulers will catch a crank pin on the drive rod in turns. Shimming the wheels fixes this. Also, if the styrene strips are placed right at the top of the axle bearing grooves, they add to the bearing surface and will reduce the inevitable wear at that point. On some Big Haulers, the electrical pickup contacts don't touch the wheels at the extremes of the axle play. Reduction of the play will improve power pickup in this case. And finally, it may just be my imagination, but after I shimmed the rear axle also, I think that the front truck doesn't derail quite as often anymore. One of many possible exhaust sequences will have two loud beats followed by two less loud beats. In this case one of the existing straps on the sound drum must be removed because it is in the wrong place. First gently pull the drivers out of the frame. A very small Phillips screwdriver is needed to access the screws that hold the straps by working between the spokes in the front driver. Remove the screws on one strap (pick the easier one) and remove the strap. Save the pieces in case you want to reverse the modification. Reinstall the drivers being careful not to damage the electrical contacts to the drivers. Your Big Hauler may have small spring loaded piston type contacts, or if it is an older one, it will have spring straps for contact brushes. Check that all four contacts are still touching the wheels at both ends of the axle play. 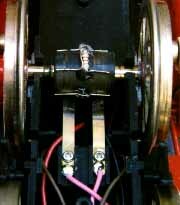 If your locomotive has piston type contacts, check each one with an ohmmeter to make sure that it actually works. 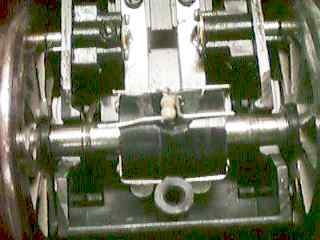 Some Bachmann piston contacts fail because the spring doesn't press hard enough against the back contact plate, probably due to loss of tension due to heating. I've had two contacts actually melt down. If yours don't work, carefully remove the contact assembly which is held to the frame by two very small screws and then remove another set of very small screws on the back to remove the contact plate. You should not have to unsolder the wire to the contact plate. Clean the contact plate, stretch the spring slightly and reassemble and reinstall the contact assemblies. If that doesn't fix it then trash the Bachmann contact and install an LGB replacement contact. Hot glue works well enough to hold the contact in place and it can be removed later if necessary. Solder the wire from the old contact to the new LGB contact housing before you hot glue the contact in place. Once you have shimmed and reinstalled the driver wheels, install two 100 ohm resistors on the sound drum with hot glue or Zap-CA gapfiller cyanoacrylate adhesive. Bend one lead 180 degrees so that it runs back across the resistor body and then bend both leads 90 degrees so that they are colinear again. Use 1/8 to 1/20 watt resistors, an average 1/4 watt resistor is too big. These resistors should be positioned with their leads running across the drum at the 90 degree and 180 degree points away from the remaining strap. Then install a bare wire across the last 90 degree point. 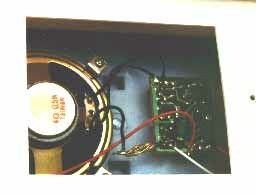 The photo shows one resistor and one contact wire installed. You can test the sound at this point by connecting the tender and powering the locomotive with clip leads to the pilot wheels. There one complication on the Bachmann 2-4-2 Columbia that doesn't exist on the Big Hauler. The sound drum is so close to the front mounting post for the bottom cover that the resistors won't fit without permanent modifications to the drum. I cut grooves into the drum with a motor tool to recess the resistors and glued them on with Zap-CA. Also, if you try to run the Columbia with the bottom cover removed, the rear axle will pop out. Install the cover before testing the loco. If all is well, reassemble the locomotive and enjoy your improved Big Hauler sound. I originally used magnetic reed switches to avoid the axle play problem. The method worked and one of my engines was wired this way until just recently. One of the reed switches started getting flaky and missing beats at higher speeds so I have changed it to the method described above. Some of the axle play must still be removed, although there is a lot more tolerance to movement of the axle. If you want to use reed switches, buy some very small ones. I used Newark Electronics part number 50F7985 switches ($0.91 each) and 33F1090 magnets ($0.76 each). Bend the two contact springs slightly away from the sound drum and solder the leads of the loud chuff switch directly to the contact springs. Position the reed switch to the left side of the locomotive spaced slightly away from the sound drum. Solder another switch with a 100 ohm resistor in series to the contact springs positioned to the right side of the locomotive. You can leave the contact straps on the sound drum. Hot glue 4 magnets, two on the left and two on the right sides of the sound drum and position the reed switches for reliable operation. You will need a fairly small gap between the magnets and the switches. That large bundle of resistors in the photo is the 10 ohm resistor. I didn't have any 10 ohm resistors in my junk box at the time so I used ten 100 ohm resistors in parallel. This was my first modification, and in this case, I mounted the 10 ohm resistor in the engine instead of in the tender. If you use reed switches, the 10 ohm resistor is critically important because without it the capacitor discharge current can weld the contacts of a reed switch and make it stick, maybe permanently. The noise generator used in the Bachmann Sound System is somewhat band limited, especially at the low end resulting in a tinny chuff sound. The low frequency response of the circuit can be improved somewhat with the addition of two capacitors. Don't expect miracles from this change, but it does help. The two new parts (the one at the center and the one on the right) are simply soldered to the bottom of the board, no cutting of traces is required and the parts can be removed later if desired. The 330 microfarad capacitor (any value larger that 100 microfarad will work as well) is wired in parallel with the existing DC blocking capacitor that is already on the board. This new part allows more low frequency energy to be coupled to the speaker. A 0.1 microfarad capacitor is also wired in parallel with an existing coupling capacitor to allow more of the low frequency noise generated within the board to be coupled to the power amplifier stages. Do not try to increase the value of the other 0.1 microfarad coupling capacitor. This will tend to make the noise generator very unstable. Been there, done that. With the addition of six inexpensive parts to the locomotive, the sound will stop when there is no track power. While this modification is just a little more involved that the other changes, it is still easy. The sound system runs off a 9 volt battery in the tender. This allows the sound intensity to be independent of track voltage, but it also prevents the sound system from knowing when to shut up. If the locomotive stops with the sound drum contacts closed, the sound will run continuously until the locomotive is nudged a little to open the contacts. Since the locomotive stops with the sound running about half the time, something had to be done to fix it. The simple circuit shown below detects track voltage in either polarity and disables the sound system when the average track voltage drops below about 1.5 volts. The Bachmann Big Hauler won't move below 2 volts, so as the track voltage is increased, the sound system becomes active just before the locomotive starts to move. The four diodes form a bridge rectifier. This circuit converts track voltage of either polarity into an output of one polarity only. This output signal is applied through a current limiting resistor to the base of a transistor. The transistor acts as the shutoff switch. 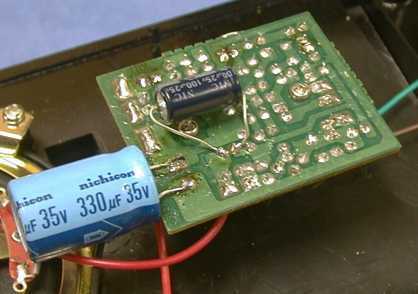 When track voltage exceeds about 1.5 volts and current in the base starts to flow, the transistor turns on and connects the sound switch to the sound board in the tender. From that point, the sound system works as normal, but with a little less intensity as there is some voltage drop across the transistor. I wired this circuit in a self supporting fashion surrounding one of the mounting posts for the locomotive bottom cover. This locomotive also has the four chuff modification described above. First, you will need to determine which wire leaving the sound switch is the negative one. With the locomotive bottom cover removed, plug the sound connector from tender into the locomotive and rotate the locomotive wheels until the sound stops. Measure the voltage at the sound contacts and determine which is the negative contact. The wire leading to this contact will be removed and reconnected to the transistor emitter lead as shown in the diagram above. 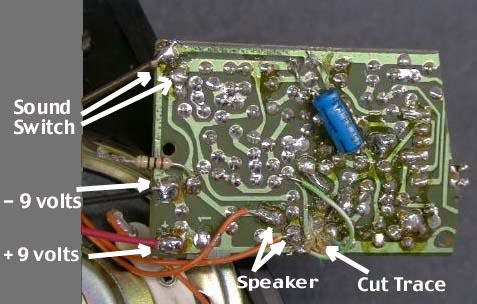 The transistor collector lead connects back to the contact where the wire was removed. Track power is picked up by attaching wires from the bridge rectifier to the existing wheel contacts. The parts are very non critical. Practically any silicon switching or rectifier diode will work in the bridge rectifier circuit. The 1N4000 (50 v, 1 amp) or better can be found at most electronics parts stores. The four diodes don't even have to be the same type. The transistor is a general purpose NPN type, a 2N2222 is one type that will work well. I don't even know what kind of transistor I used, it was an unmarked device I scrounged from the bottom of my electronic parts junk box. If the small loss of sound intensity bothers you, then add a single 1.5 volt AA cell in series with the 9V battery in the tender. This will overcome the losses caused by the switching circuit, and then some. The circuit above will work properly with practically any power pack at the cost of some loss of sound intensity. If you use Aristo PWC and you have already modified your tender to pick up power then you can use another circuit to power the sound circuit. This also replaces the battery. You also will not need the sound switch circuit in the schematic above. An LM317T adjustable voltage regulator can be used to power the sound circuit. When the track voltage goes away, the power to the sound circuit does too and the sound system shuts down. If the 680 ohm resistor is adjusted upward or downward by maybe 100 ohms, the output voltage of the regulator will change which will also change the power output of the sound circuit so that the chuff is louder or softer. In this circuit, the regulator does not need a heat sink. The sound circuit draws so little current that the regulator will not heat up. Note that this circuit REQUIRES an Aristo PWC power pack to work properly. The 5 microfarad or so capacitor will charge up on the PWC peaks as soon as the first short pulses hit the track and the regulator will go right up to 9 volts immediately. With conventional linear track power, you will need about 11 volts on the track before the regulator will generate enough voltage to power the sound system properly. By that time, your engine is moving right along. Also, if you use a power pack that does not have a pure DC output, the sound system will buzz or hum at most speeds. The input wires to the circuit can hook to either rail, polarity is not important. The output wires are polarity sensitive. For reference, the positive battery terminal is the one on the engineer's side. I soldered the output terminals of the regulator circuit right to the battery terminals. The radio controlled Big Hauler has the same sound generator circuit in it, but it is packaged differently. The sound generator and speaker from a defunct R/C Big Hauler can be recovered to use in some other locomotive for a cheap and dirty sound install. 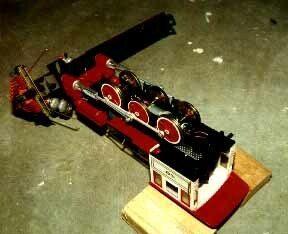 The sound generator is located on a circuit board that can be found inside the smoke box of an R/C Big Hauler. This board also contains the radio receiver and motor controller, which will no longer be needed If there is room for the whole board, it is necessary to cut only one trace and disable the receiver and motor controller so that they don't drain the battery. If the board is too long, it can simply hacked in down to size. This board was hacked right through the motor controller integrated circuit as it was easy to cut there. If the board is still too big, it can be cut anywhere to the right of the place where the photo shows to cut a trace. All the modifications to shape the chuff or improve the bass response can be done to this board as well. Six wires need to be attached to the board as shown in the photo. This board has a 10 ohm resistor added to the chuff circuit to limit the current to the chuff switch. As of sometime in 2000, Bachmann has changed the sound board. The new circuit can be identified from the outside of the tender as it has a volume control knob underneath the tender floor. It no longer will blow a continuous chuff when stopped, but the chuff profile is poor, it's decay is way too long. This can be fixed. I've traced out the circuit of the new board as shown below. It is basically the same circuit, but some new parts are added to cause the unit to blow a constant length chuff each time it is triggered instead of chuffs that vary in length as compared to locomotive speed. Actually, once you've added the circuit described above to stop the continuous chuff, the old version works better. Real engine valves move faster at higher engine speeds and the chuff bark will shorten with increasing speed. The old system would do that, the new one won't. It is not practical to adapt the uneven beat chuff method to the new circuit but you can add new trigger wires to the sound drum to get four beats per driver turn. Note that there are some differences, especially in the noise generator section, of this schematic as compared to the ones above. This is most likely an error on my part. Since I've checked this schematic carefully, it is probably correct and the ones above are probably wrong, but it really doesn't matter as none of the modifications involve that part of the circuit. Q1 is a new part and key to the change in the circuit. When the chuff switch closes, a packet of charge is delivered through C1 to the base of Q1 which turns Q1 on until C1 charges up. This time constant determines the chuff duration as Q1 now acts like the chuff switch on the old circuit and activates the noise generator and amplifier. It also charges C10 in the process. When Q1 turns off, the noise generator and amplifier continue to run on the charge stored in C10. The problem is that C10 is much too large and the circuit just dies off much too slowly dragging out the decay of the chuff. The fix is the reduce the value of C10 by about a factor of 5. C10 is the largest part on the board and it is labeled on the board so that it easy to find. Just remove the old C10 and install a new capacitor rated between 330 and 500 uF at 10 volts or better in its place. The part I used was a little too tall to fit right back where the old one was, so I hung it off to the side of the board. Pay attention to the polarity marking on the board and the part, they MUST match. I also installed another capacitor in parallel with C8, the output coupling capacitor, to give the sound a little boost in the low end. The difference is minor, but it is detectable. The chuff has a little more authority than before. Increasing the values of the other coupling capacitors doesn't seem to help this board as much as the older one.